43. Neilson, S.** and N. Rajakaruna. 2014. Phytoremediation of Agricultural Soils: Using plants to clean metal-contaminated arable lands. In: Phytoremediation: Management of Environmental Contaminants, pp. 159-168, Eds. A. A. Ansari, S. S. Gill, G. R. Lanza, and L. Newman. Springer (PDF). 32. Anacker, B. L., N. Rajakaruna, D. D. Ackerly, S. P. Harrison, J. E. Keeley, and M. C. Vasey. 2011. Ecological strategies in California chaparral: Interacting effects of soils, climate, and fire on specific leaf area. 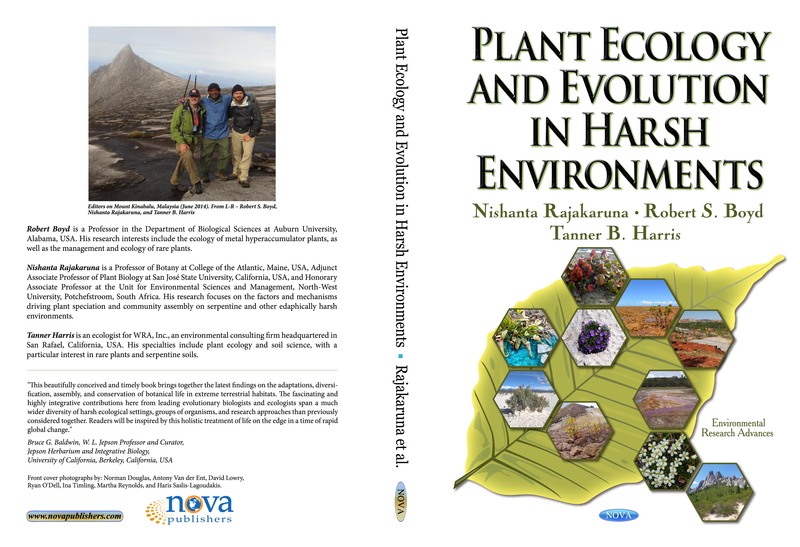 Plant Ecology and Diversity 4: 179-188, DOI:10.1080/17550874.2011.633573 (PDF; Supplementary Materials). 29. R. E. O’Dell and N. Rajakaruna. 2011. Intraspecific variation, adaptation, and evolution. In: Harrison, S. P. and N. Rajakaruna (Eds.). Serpentine: Evolution and Ecology in a Model System, pp. 97-137. University of California Press, Berkeley, CA, USA. (Proofs here). 28. S. P. Harrison and N. Rajakaruna. 2011. What have we learned from serpentine about evolution, ecology, and other sciences? In: Harrison, S. P. and N. Rajakaruna (Eds.). Serpentine: Evolution and Ecology in a Model System, pp. 417-427. University of California Press, Berkeley, CA, USA. (Proofs here). 22. Rajakaruna, N., and R. S. Boyd (Eds.). 2009. Soil and Biota of Serpentine: A World View. Proceedings of the Sixth International Conference on Serpentine Ecology. Northeastern Naturalist 16 (Special Issue 5). Medeiros, I. D.* and N. Rajakaruna. The serpentine biota of Massachusetts: Vascular plants, lichens, and bryophytes on serpentinite outcrops in western Massachusetts, USA. In prep. Target journal: Rhodora. Medeiros, I. D.* and N. Rajakaruna. Additional notes on the plants of Callahan Mine: Tissue elemental data for Tussilago farfara L. (Asteraceae) and an initial survey of bryophyte diversity at a polluted site in coastal Maine. In prep. Target journal: Rhodora. Medeiros, I.D. *, F.C. Olday, and N. Rajakaruna. Lichen biota of Settlement Quarry, a former granite quarry on Deer Island, Maine, USA. Target Journal: Rhodora. 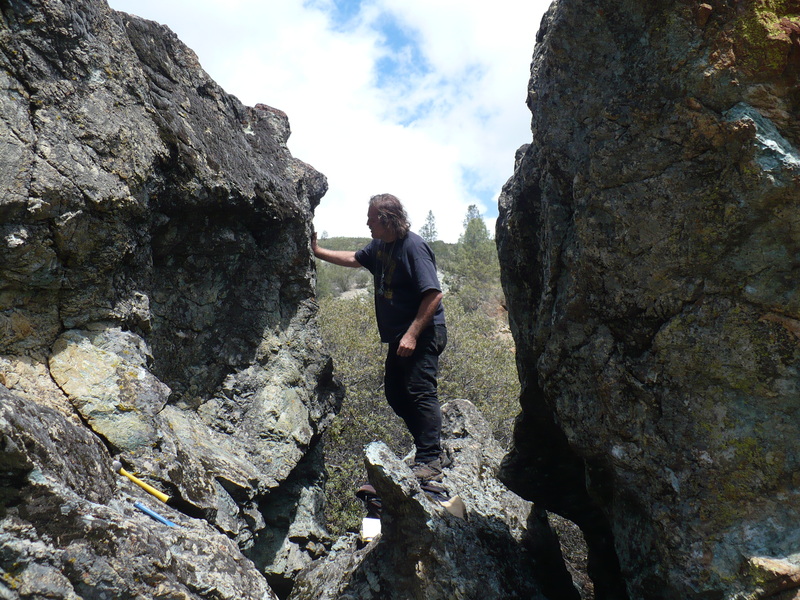 Dr. Kerry Knudsen collecting saxicolous lichens at the New Idria Serpentine Mass, CA, USA. The results of this study are reported in the manuscript listed as # 38 above. 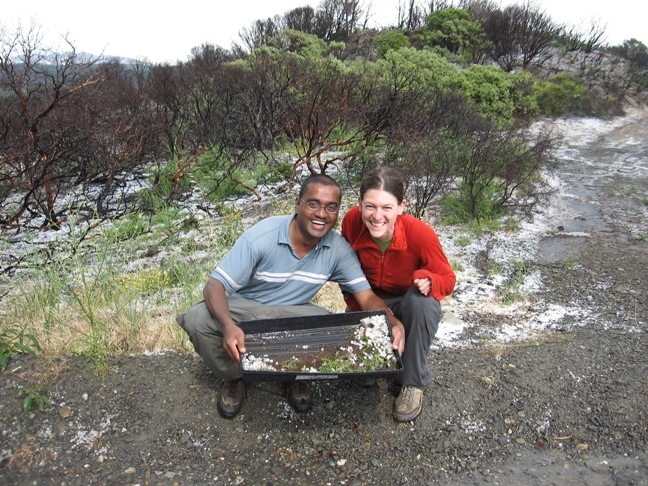 Nishi Rajakaruna (L) Annette Bieger (R) showing off some seedlings of chaparral shrubs collected for the reciprocal transplant study reported in the manuscript listed as # 35 above.